Meghan learned about challenges national parks face in Tanzania. PHOTOS COURTESY OF MEGHAN SHEA. Meghan Shea, a 2011 Intel ISEF finalist and 2013 Intel STS finalist, is a junior Environmental Systems Engineering major at Stanford University. Since entering college, she has been conducting more field work. She has traveled from Tanzania to Tahiti to islands in Oceania to conduct research. 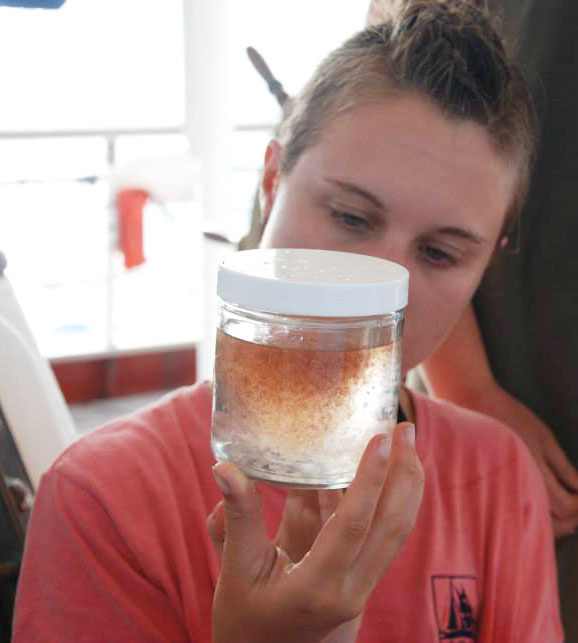 Meghan is focusing in oceanographic field work, and spent a semester at sea and in Palau to research DNA at different ocean depths and carbonate chemistry in seabed grass. The Society asked her to describe her research interests in depth. How does science offer you the opportunity to travel the world? Science (and Stanford) have led me all over the world this past year. Since coming to Stanford, I have been pursuing opportunities to research and understand the world around me, and I’ve been lucky that many of those opportunities have involved travel. Before sophomore year, I spent two weeks over the summer in Tanzania learning about the challenges of national parks through a class, and then headed to Hawaii to spend all quarter learning about natural science by doing field work through the Wrigley Field Program. In the spring I participated in the Stanford@program, where I completed oceanographic research while crewing a tall ship from Tahiti to Hawaii, and then I headed to Palau for a summer of independent carbonate chemistry research and a class on coral reef ecosystems and policy. Before Stanford, science was something that existed in a laboratory, so I have been working to refine my vision of what doing science in the field looks like and how to bridge the gap between the field and the lab. Meghan studies coral reefs in Hawaii. Tell us about Stanford@SEA. Where did you travel and what were you researching? Stanford@SEA is a really unique opportunity. For the first five weeks of the quarter, we lived at Stanford’s marine station in Monterey and took intense days of classes in oceanography, nautical science, and maritime studies. We also began planning research projects that we could complete while at sea. Then, the whole class flew to Tahiti to board the Robert C. Seamans, a tall ship outfitted as a research vessel owned by the Sea Education Association. Our crew sailed from Tahiti to Hawaii, stopping at Rangiroa, Karorina (Millennium Atoll), Malden Island, Kiritimati (Christmas Island), and Tabuaeraon (Fanning Island). As students, we sailed with dual roles — we were actively involved in crewing the ship and worked in the laboratory collecting a full suite of oceanographic data. As part of my project for the class, I filtered water samples from different depths along our cruise track to use for an eDNA analysis. Now, I’m just getting started extracting the DNA from all of the samples. eDNA — or using DNA found in the environment to figure out what species might be there — hasn’t been extensively tested in ocean water, so I’m excited to see what I find in the samples. Participating in Intel STS and ISEF was hugely important in my continued STEM pursuits. Coming from a high school without a large number of students doing science projects, it was easy to feel isolated — but STS and ISEF made me a part of a much larger network of likeminded students, many of whom continue to be friends and sources of inspiration. After the Stanford@SEA program finished in Hawaii, I headed to Palau on a research grant to work with PhD student Heidi Hirsh on projects looking at the carbonate chemistry over seagrass beds. Because seagrass beds are so productive during the day, there is some hope that seagrass beds adjacent to coral reefs might raise the pH of the water during the day as they photosynthesize and shield the coral reefs from the effects of ocean acidification. We took a lot of different carbonate chemistry measurements around seagrass beds, both in the wild and in the Palau Aquarium, and we’re working on processing all of that data now. 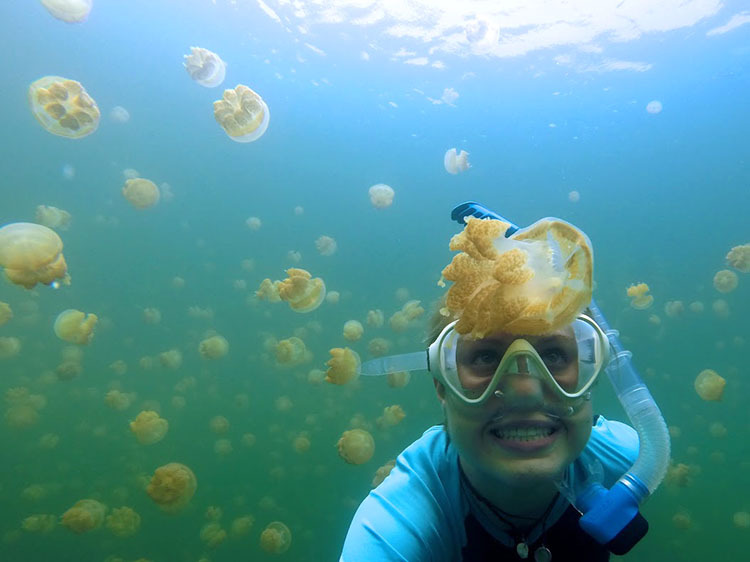 Meghan swims with jellyfish in Palau. What was the most challenging aspect of Stanford@SEA? What was the most fascinating thing? The most challenging aspect was trying to balance time. We operated on a watch schedule, so you were on watch for rotating three to six-hour chunks throughout the day. While on watch, you would either be actively crewing the ship or working in the lab. While off watch, you could sleep — but you could also work on your research project, hang out with friends on the ship, take care of your laundry, journal, read, edit all the photos you took at that last island stop, or try to find some time for yourself. There was always so much to do that it was challenging to squeeze everything in and still stay healthy and well-rested for the next day! The most fascinating part of the trip was visiting Karorina (Millenium Atoll). Karorina is considered to be one of the most pristine reefs on the planet — the atoll has been uninhabited for the vast majority of its history and is geographically isolated from most human influences. I had never before gotten to experience a reef so far removed from humans, and without heavy fishing pressure we saw an abundance of sharks and large fish. How did you become interested in oceanographic field work? I have always been fascinated by the oceans. When I was six, I started telling anyone who would listen that I wanted to be a marine biologist specializing in seahorses. While my career interests have certainly broadened since then, I have retained my love and interest in the ocean. The fact that we have explored such a small fraction of the world’s oceans makes doing oceanographic field work all the more exciting — you are studying and observing features of the earth that are rarely seen, something that is almost inconceivable given how much technology we have developed. Meghan takes note of plankton counts. Do you have other STEM-related projects or goals that you’re pursuing? Right now, I’m gearing up to travel to the UNFCCC COP 21 climate conference in Paris this December (again through a Stanford class). As someone who wants to go into a career in research, I think it’s so important to understand the context of your work. If science isn’t picked up by other audiences — be it policymakers, the general public, industry, etc. — it can never result in positive change. I'm excited to see how climate science is integrated into international climate negotiations and how scientists are able to toe the line between doing unbiased work and being advocates for the changes their work suggests. What was your most memorable experience at Intel STS 2013 or Intel ISEF 2011? I have two memorable moments from Intel STS 2013 — both for the same reason. I had been doing independent science research since seventh grade, and while competing in the local science fair circuit and presenting my work was always fulfilling, I always felt that as a high schooler working mainly in my high school lab, I was just preparing to do real science in the future. Shaking hands with President Obama and realizing that the President of the United States had just taken time out of his extraordinarily busy schedule to recognize our work was an incredible moment of validation after years of guesswork, trial and error, and frustrating experiment failures. That same energy was present in the room during public viewing — seeing how many people were excited to learn more about our projects made me all the more excited to keep researching and questioning. President Obama shaking hands with Meghan for Intel STS 2013. Photo courtesy of SSP. Can you provide a short description of your research project(s)? For my Intel STS project, I designed a water filter using seeds from the Moringa oleifera tree and household items that could remove up to 99% of E. coli in water samples. M. oleifera seeds naturally coagulate particulates and bacteria in water, so that they could then be filtered via much more rudimentary means (soil, charcoal, and fabric). Moringa oleifera trees grow in many regions where potable water is particularly scare (sub-Saharan Africa, Central and South America), so my hope is that the filter can someday be implemented as an easy point-of-use water purification system for families without more sophisticated ways of cleaning their water. Has your involvement in Intel STS or ISEF influenced you to pursue STEM or promote STEM to others? Participating in Intel STS and ISEF was hugely important in my continued STEM pursuits. I was connected with and inspired by other young people doing incredible scientific work and was shown that my work and the work of my peers was valued and important. Coming from a high school without a large number of students doing science projects, it was easy to feel isolated — but STS and ISEF made me a part of a much larger network of likeminded students, many of whom continue to be friends and sources of inspiration. The best way to understand science and math is to go out and do it on your own — and you do not need to have access to a lab or fancy equipment to ask questions about the world around you. Find something you're passionate about, come up with an idea you want to test, and go out and do it. I’ve learned more through research than I’ve ever learned in a class, or a lecture, or a textbook.